Arden Wray is a Toronto-based photographer with a BFA in photography from Concordia University. Her work has appeared in The New York Times, British Vogue, and elsewhere. In 2016, she was a winner of the Magenta Foundation’s Flash Forward competition. 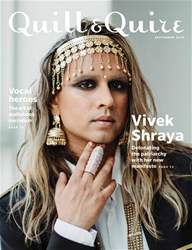 Arden shot this month’s cover feature of author Vivek Shraya. Megan Haynes is a Toronto-based writer and editor. Her work has appeared in Chatelaine, Fast Company, the Toronto Star, Metro News, and more. This issue, she writes about The Malahat Review’s uncertain future (p. 7).